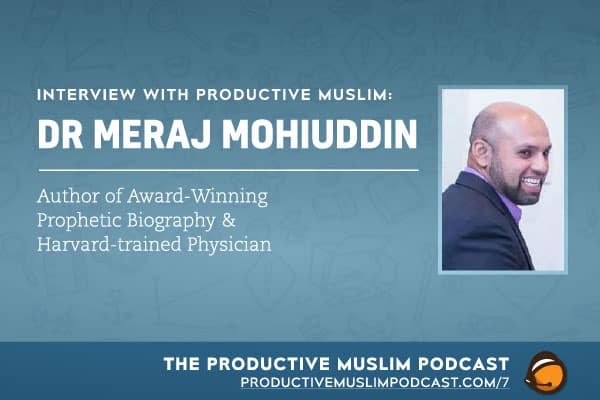 Our guest for today is Dr. Meraj Mohiuddin. Dr. Meraj is a Harvard-trained practicing Physician with a background in neuroscience. He is a writer and a father living in Phoenix, Arizona. He is an author of the award-winning book ‘Revelation’, based on the life of the Prophet (PBUH) and the story of Quranic revelation in the English language. Dr. Meraj will be sharing his valuable insights on productivity and giving us practical pieces of advice from the sunnah for us to implement. How to stay focused and persistent in the pursuit of your dreams. The methodology of setting deadlines for completing tasks. Taking Prophet (PBUH) as our guide and coach. Connect with Dr. Meraj through his website or on Facebook.